RARBG, one of the world's most popular torrent sites, has just received a pile of paperwork from major rightsholders including Village Roadshow, Disney, Universal and Warner. A letter sent from a Sydney lawfirm claims that the site infringes on "an enormous scale" and says that a blocking application was filed in February. It appears that local ISPs will not contest the action. Following a case brought by Roadshow Films, Foxtel, Disney, Paramount, Columbia, and 20th Century Fox, last December more than fifty Australia ISPs were ordered to start barring subscriber access to ‘pirate’ sites. The Pirate Bay, Torrentz, TorrentHound, IsoHunt, streaming service SolarMovie and a wide range of proxy and mirror sites were all included in the action but rightsholders still hadn’t finished. In February it was reported that a second round of blocking litigation had got underway, this time targeting ExtraTorrent, RARBG, Demonoid, LimeTorrents and dozens more. While copyright holders will have little difficulty in obtaining a new injunction against this fresh batch of sites, they still have to follow procedure. A framework is laid out in the Copyright Amendment (Online Infringement) Act 2015, the legislation which authorized site-blocking in Australia. 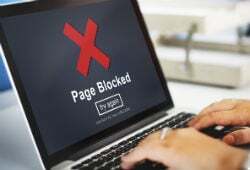 There are three sets of parties to any action – the owner of the copyrights being infringed, the Internet service providers being asked to block the sites, and the person who operates the site or service which is allegedly infringing copyright. While the first two sets of parties are always involved, it’s recognized that torrent and streaming site operators probably won’t turn up to argue their case in Australia. Nevertheless, they are given a chance to appear, but for that to happen they first have to be notified of proceedings. Such notification is the responsibility of copyright holders who must make “reasonable efforts” to determine the identity or address of the person who operates the “online location” in order to deliver a notice. If that is not possible, then the Court can waive the requirement. TorrentFreak has learned that during the past several days, lawyers acting for copyright holders have indeed been trying to reach the operators of sites. RARBG, one of the torrent platforms listed in the latest complaint, informs us that they’ve received correspondence from Sydney lawfirm Baker & McKenzie, advising that a blocking application is underway. 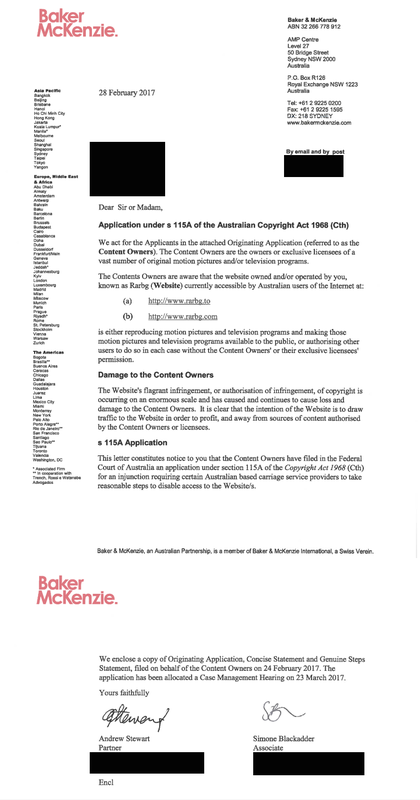 The letter, headed ‘Application under s115a of the Australian Copyright Act 1968’ notes that the lawfirm is acting on behalf of content owners who claim that RARBG is either reproducing motion picture and television programs and making them available to the public, or authorizing other users to do so without permission. “The Website’s flagrant infringement, or authorization of infringement, of copyright is occurring on an enormous scale and has caused and continues to cause loss and damage to the Content Owners. It is clear that the intention of the Website is to draw traffic to the Website in order to profit, and away from sources of content authorized by the Content Owners or licensees,” it reads. Additional documents were included in the package, such as a statement of facts and a “genuine steps” statement. This is a requirement under the Civil Dispute Resolution Act 2011 and details steps that we taken to try and solve the dispute before taking it to court. In the main, the document references pre-application discussion with four broad ISP groups. There are almost 50 respondents in all including Pacnet, Optus, Virgin, M2, Primus, Dodo, Eftel, Vocus, Amcom, Amnet, Nextgen, TPG, iiNet, Internode, Vividwireless, Chariot, PIPE, TransACT and many more. In basic terms, all providers indicated that they won’t contest the application for an injunction but did raise objections over the issue of costs, a common but not insurmountable issue in most copyright-related cases. There will be a case management hearing March 23, 2017, so expect more developments after that date.